The solution is simple to enable Shutdown, Hibernate, Logoff, Lock-Computer feature in Windows To-Tray area with ProcessKO ! Please download the Freeware ProcessKO and start this small Windows-Tool! In ProcessOK click System and Shutdown features via Tray (... see Image-1 Arrow-1). Open notify area and drag the shutdown icon to visible Tray-Area! (... see Image-1 Arrow-2)! Hot-Tip: ► Don't Sleep - Prevent Shutdown, Stand By, Turn Off, Restart! (Image-1) Enable Shutdown, Restart, Log-Off in Windows To-Tray! 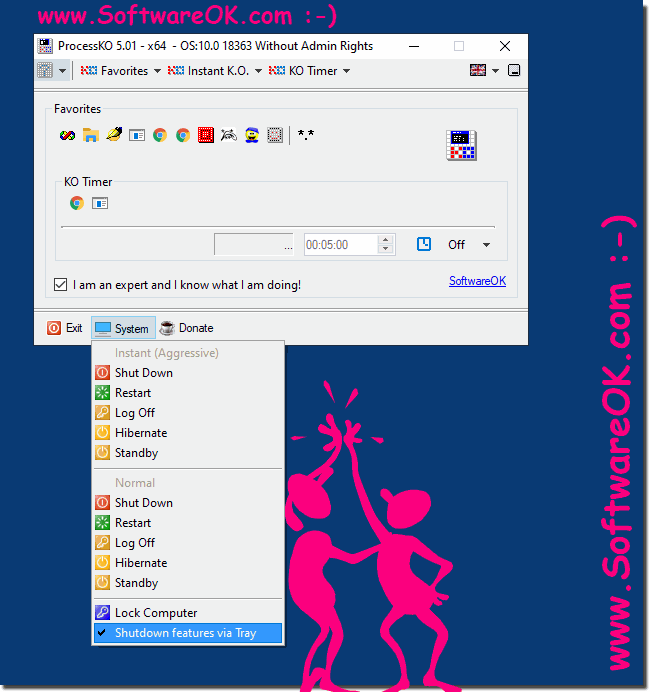 ProcessKO - FAQ-2: Enable Shutdown feature in Windows To-Tray area! Shutdown, log-off Restart in windows 8.1 tray! ?